After more than three months in a Greek prison, 23-year-old Berlin-based Syrian refugee Sara Mardini was released on bail on Wednesday. Her case, however, is far from closed and raises questions about the criminalization of humanitarian work. Mardini is the sister of Yusra Mardini, who became internationally known for swimming on the Refugee Olympics team during the 2016 Olympics in Rio. The sisters made the dangerous crossing from Turkey to Greece in a flimsy rubber dinghy in 2015 during the height of the migration crisis. Despite being trained swimmers, they nearly met their deaths when the engine failed and the boat began to sink. The girls and another passenger jumped into the water in an attempt to push the vessel and its 18 passengers to shore. Their journey is detailed in Yusra’s autobiography “Butterfly,” which was released this summer. While her younger sister went on to continue swimming professionally, Sara Mardini returned to Lesbos multiple times in two years to volunteer for the Greek non-profit Emergency Response Center International (ECRI). After her last volunteering stint, Mardini was on her way back to start a new semester at Bard University in Berlin when she was arrested and put into an Athens prison on pretrial detention. As the result of a lengthy investigation, Greek police accused Mardini, as well as fellow volunteer, Irish national Sean Binder, and ECRI’s Nassos Karakitsos of offenses including money laundering, smuggling, trafficking and even espionage. If charged, Mardini could face 25 years in prison. 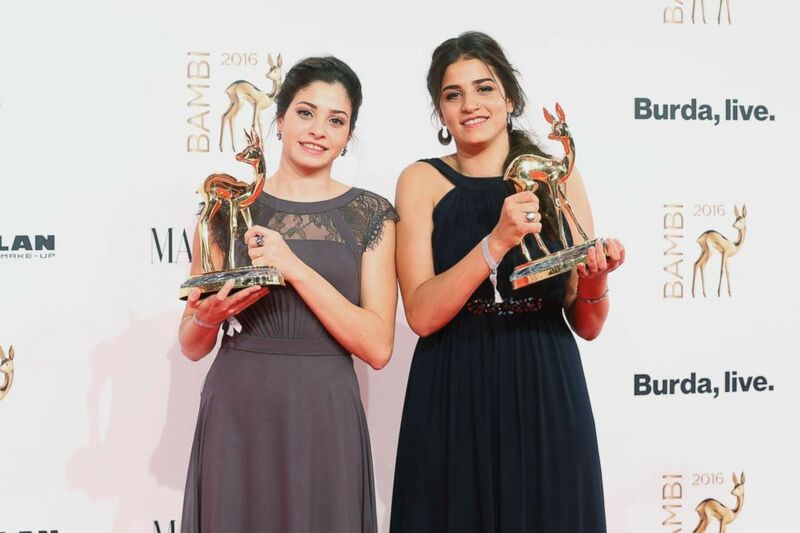 Yusra Mardini and Sara Mardini pose with award at the Bambi Awards 2016 winners board at Stage Theater, Nov. 17, 2016, in Berlin. The case raised alarm bells around Europe. Mardini’s lawyers and rights groups, such as Human Rights Watch, say the charges are unfounded and an attempt to criminalize humanitarian aid -- in this case by misrepresenting humanitarian search and rescue work. Her lawyer, Zakarias Kesses, told ABC News that this is the first case in which police declared that a registered non-profit organization was a “criminal team” that illegally profited from donations it received through fundraising. Lesbos is home to an estimated 10,000 refugees, who live in overcrowded camps such as Moria, where there is one toilet for every 190 people, according to UNHCR. In addition to search and rescue operations, ERCI provided medical care and some non-formal education to migrants on the island. It was forced to suspend operations after its volunteers and senior staff were jailed. “This sends a chilling effect to other would-be humanitarians who just want to help and deprives people of these services that the state isn’t providing and only this NGO is providing,” Human Rights Watch researcher Bill Van Esveld told ABC News. Mardini’s case isn’t the first of its kind in Greece. In 2016, Greek authorities arrested five foreign volunteers on the island, accusing them of aiding illegal migration. They were acquitted this past May. After Mardini’s lawyers proved that she and Binder did not have direct contact with smugglers or access to classified documents, the request for release on bail was granted on Tuesday. The trial will continue after Mardini and Binder return to Germany. 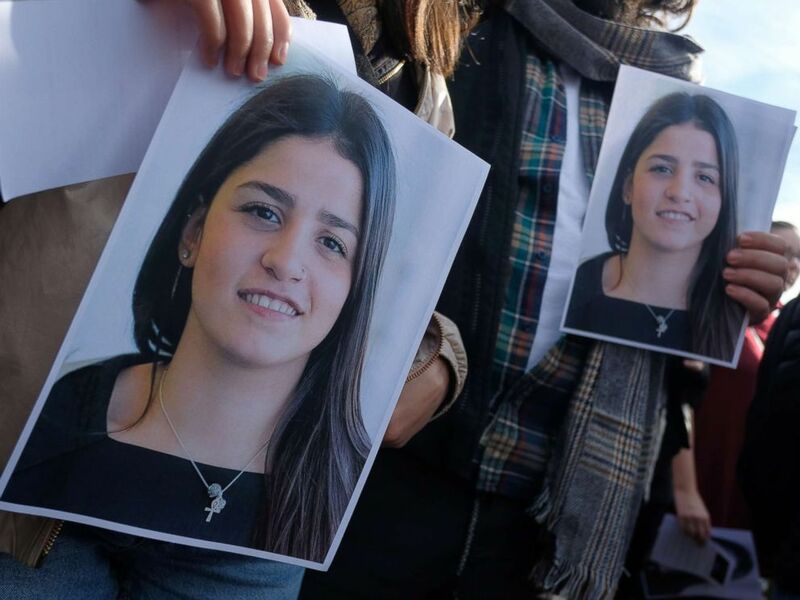 Students from Bard College hold up a photograph of their classmate Sara Mardini, a Syrian refugee who is being held in Greece on charges of people smuggling and spying, during a demonstration to demand her release, Oct. 20, 2018, in Berlin. Mardini was far from forgotten in Berlin while jailed. Bard University helped organize a team of lawyers with the help of family friend Sven Spannekrebs. Her classmates held a demonstration in front of the Brandenburg gate and the administration reached out to rights groups and politicians to raise awareness. Bard professor Florian Becker told ABC News he was “relieved and happy” to hear Mardini would be coming home but felt “extensive damage” had been done. “Other young people, whether they are already volunteering in sea rescue or were thinking about doing that have been deterred – that’s already happened,” he said.